Print your company logo, address, phone number, etc. on your customized beer kaddy. Extensive selection of materials colors and ink colors. 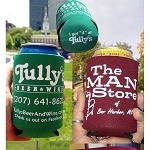 Personalized can and bottle insulators are made with insulating Neoprene wet suit material. Keep cans and bottles cool. Keep hands dry. Can kaddies fold flat for purse or pocket carry. Bottle suits have zippers. Whether you call these can and bottle holders "Can Kaddies," "Holders," or "Huggies" they will bring more business to your store.